Sled dog racing without snow? In Canterbury, we race on dry tracks through forests. Anywhere from one dog to eight dogs can be used to pull. Scooters are pulled by one and two dogs, while three wheeled carts (called rigs) are pulled by three or more dogs. 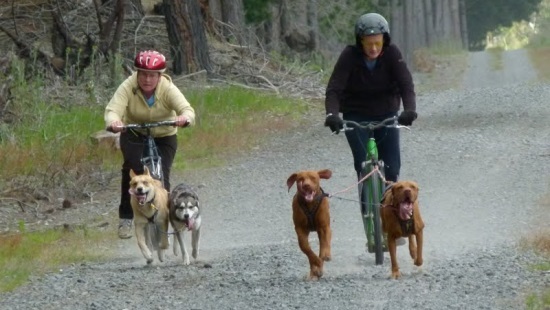 The club also runs Canicross (running and being pulled by your dog) as well as Bikejoring, where the dog pulls while your bike. Find out more about Dryland Racing. What type of dogs can race? Any type of medium to large dog that is fit and healthy can be trained to race. Traditional dog breeds used include Siberian Huskies, Alaskan Malamutes and Samoyeds. In Canterbury conditions, racing on dryland (rather than snow) breeds of dogs that can be trained to pull include Pointers, German Shepherds, Border Collies, Beardies, Labradors, Vizslas, Dalmations and cross breeds. Find out more about the dogs.